Frederick James Dunn was born in Windsor, England about 1882. 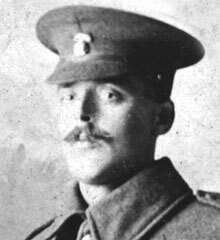 Previous to moving to Dungannon, Frederick had served four years with the 1st (Volunteer) Battalion Royal Berks Regiment in England. He was married to Edith Mary Dunn. Frederick Dunn had been estate carpenter to the Earl of Ranfurly for over three years. He had also been a section leader in the Dungannon Battalion U.V.F. At the outbreak of war, in August 1914, he joined joining the 6th Inniskillings. He later was transferred to the 5th Battalion Royal Irish Regiment (Pioneers). Corporal Frederick J Dunn was killed in action at Gallipoli on 16 August 1915.